Perched on Hoshiarpur-Dharamsala road, Shiv Bari sits on the bank of the river Swan and this place is considered as a practicing area for archery pupils of Guru Dronacharya. 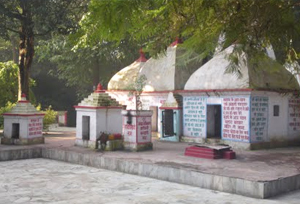 As per legend, the lord Shiva temple in the Shiv Bari was built by Guru Dronacharya for his daughter Jayati to worship the Hindu Lord Shiva. A large number of people throng this place to offer bouquets to the Shiva ling in the months of July and August.